Welcome to those who are new to the Darwin Shaman deck and to those who have been following this deck since WotOG and giving constant great feedback. The deck has now been updated to include a number of new ONiK cards that are surprisingly synergistic with the evolve mechanic. Darwin Shaman is an aggressive midrange deck built around the evolve mechanic in which two cards, Evolve and Master of Evolution, upgrade your minions (including totems) to those of a higher mana cost. The strategy revolves around maintaining tempo and building a large board of minions and totems, using them for their initial purpose to gain maximum value out of them, before evolving them into large boards of strong minions. One Night in Karazhan has already introduced three new cards perfectly suited to the deck: Barnes is a 4 mana 3/4 that summons a 1/1 copy of a minion from your deck, that copy retains the original mana cost of the card and so a 1/1 Fire Elemental will become a random 7 drop when evolved.Moat Lurker assassinates a target minion and response it as it's deathrattle, unless of course it is evolved into something else. Finally Maelstrom Portal combined with Wrath of Air Totem or Bloodmage Thalnos becomes a cheaper, more consistent Lightning Storm that summons a token for evolution. Whether or not Spirit Claws makes the cut next week we shall see! When looking at the state of Shaman in Standard with the release of WoToG your first thought should be.. Where do I make room for all these great cards? Shaman already had some of the strongest cards in the game likeHex, Earth Shock, Flametongue Totem and Al'Akir the Windlord, but it used to have holes at various mana costs along the way and ran into trouble with it's curve due to overload. The question is then which cards make the cut. Do we go all out totems or all out evolve? The answer is we use the best of both as these cards offer such strong tempo plays. This is primarily a tempo-based midrange deck that relies on building a strong board of minions and totems before buffing them and overwhelming the opponent, so the priority must be to maintain board control in the midgame to do so. Mulligan hard for Tunnel Trogg, Totem Golem and Flame Juggler, if you have the coin it is acceptable to keep Tuskarr Totemic, Feral Spirit and Barnes. Remember that Feral Spirit is not just a defensive card, it is intense early game pressure and when evolved will give you two 3 drops. The priority in the early game is not face damage but board control. It's useful to keep your Troggs alive as long as possible but play it safe and trade them off to maintain board control if needed as losing board presence is the primary counter to this deck. If needed, use Hex aggressively to ensure you keep tempo. In the midgame you are looking to evolve your board of flooded minions and totems into a more substantial army capable of pushing overwhelming pressure on your opponent. 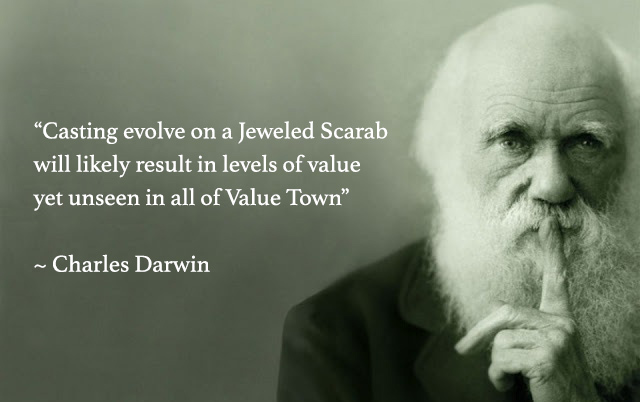 Remember to trade before evolving eg. send your Totem Golems in their 2/3s before you transform them. Evolve should be saved until you have usually 4-5 minions on the board. The possibility of Doomsayer is small but does exist so if you have many 1 drops being evolved in 2 drops, it may be advisable to have something in your hand that can deal with it before the end of your turn, for example Hex or even another Evolve. Try to use your Evolve on a minion first before then casting Master of Evolution for the obvious extra value. Sometimes you may have such great drops from your Tuskarr Totemics that it is better to hold off on evolving your board in order to gain maximum value from those summons. Flamewreathed Faceless is an option choice for this deck. It may seem counter intuitive in an evolve deck however evolve really synergises with anything overstatted in health. Just like Totem Golem, your can sack these minions into other minions and when they are near death, then evolve them. You should therefore only look to evolve your Flamewreathed Facelesss after they have attacked one or two targets, as the "upgrade" will likely be a downgrade. Similarly Jewelled Scarab if you're facing a meta in which playing a 3 mana 1/1 isn't going to cause a fatal tempo loss (currently it is). Why Tunnel Trogg? You might be thinking that Tunnel Trogg is an aggro minion but it is actually more flexible than that. 1 mana 1/3s are hard to deal with and with Shaman's overloading burn spells, including the new Stormcrack, Tunnel Trogg can allow for strong early game tempo plays. Essential in Shaman. Can I still run Jeweled Scarab? Part of the difficulty in deciding which Shaman cards to cut from the midrange deck is that the class has strong cards versus aggro and control, but often not both. Lightning Storm and Healing Wave is often a dead draw against control but essential against aggro, and the opposite is true of Hex against control. Scarab is an essential Shaman card that let's you adapt according to the deck you're facing, and it synergises strongly withEvolve and Master of Evolution. Why Bloodlust? Whilst it is very possible to find yourself evolving your larger minions into game ending legendaries, a more common scenario is that (when played correctly) you will often find yourself with a large board of weak/midgame minions. Remember that just 4 bloodlusted minions deal 12 damage before their own attack value is even included, this card wins about half of all games with this deck. In a clutch it can be used for value trades but this should only be done as a last ditch effort to maintain board control in the late game. Note that Spirit Wolves and Fire Elementals in particular are bad targets to evolve unless you have already attacked with them, in which case they will effectively be healed, however they are already so competitively statted for their cost that upgrade on average adds only a single stat point. One exception to this is if you are in desperate need of taunt, where evolving a 6 mana minion to a 7 mana minion has an almost 25% chance to give you a minion of comparable stats plus taunt. Why no Eternal Sentinel and Elemental Destruction? Whilst this combination is very powerful at getting you back into the game, it more often clogs up your hand and limits your potential to gain that early board control in the first place. Given the meta this combo has been replaced with double Lightning Storm, however should the meta change or should your mileage vary it is still a viable addition for the deck. Why Hammer of Twilight? 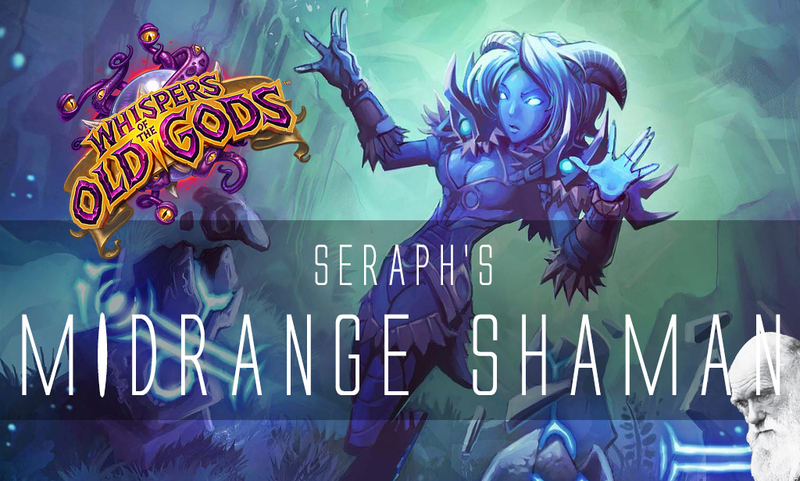 The pros seem split on this weapon but it is about as strong a tempo and board control weapon as you can imagine and those are the two central pillars of midrange Shaman. Producing a token on death that not only trades with any weapon removal in the game but is also a target for evolution. I doubt that the 4 damage this card does will be an issue given Shamans strengths in dealing incremental damage to finish off any minions with more than 4hp. WhY NoT OnyXIa? Blizzard's EU servers are not powerful enough to compute this level of value. Earth Elemental: Having a big taunt is really good and also it have 7 attack but the overload downside. there are a lot of small minions in this deck also. Knife Juggler: Can get more than 1 damage off and also Hero Power is really good. I hope you guys make these changes I personally feel comfortable with them. another thought can be -1 Tuscar Totemic and +1 Bronzebeard because Master of Evolution will tranform a minion into one that cost 2 more. really big in this deck! oh great, I just disenchanted both Tuscar Totemic. Ran this in unranked and it was pretty damn fun. Runs like a mid-range deck with win conditions of rando evolutions or bloodlust. I question Tuskarr post-nerf though. Notable mentions: moat lurker a rags > evolve. Could you update the deck for the latest patch? trying substitutes for Moat Lurker. currently usingHarrison Jones . ideas? also what in place ofBarnes? currently running aMoroes(seems to synergize with bloodlust alot). yeah it seems like a automatic loss if they get 2 mana wyrms out and you don't get extremely lucky on draws. -2 Tunnel Trogg +2 Argent Squire Because they stick to the board better and there's hardly any overload cards in the deck. I'm also thinking of swapping Maelstrom Portals for Lightning Storm. Is it real to get legend with this deck in current meta? I am 5 rank. what could i remove if i would add 2 nerubian prophet? A spirit and Portal imo, spirit is great evolve target but I can't see anything else. I personally think there are tons of other cards to put in place of Barnes. Seems you'd generally be getting a 1/1 Battlecry minion.